Ilkeston holds the distinction of being the first town in Derbyshire to have adopted and operated a fully electrical tramway system. 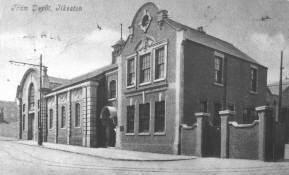 An application to install an electric tramway system in Ilkeston had been put to Ilkeston Borough Council in 1895. This was received from Messrs Derbyshire Brothers with the proposal to construct a Cable Tram system to run the length of Bath Street and South Street. The Council’s General Works Committee approved of this proposal and moved that an application be made to the Board of Trade for a Provisional Order for such a system. In 1898 the matter was further debated and despite the initial proposal by the Derbyshire Brothers, it was decided that the Corporation itself should carry out the necessary work, though with the assistance of the said Derbyshire Brothers. Councillor Edwin Trueman moved that the work be undertaken by the Council providing the engineering difficulties could be overcome. At the same time, Councillor Joseph Scattergood proposed that lines be laid from Church Street in Cotmanhay to Hallam Fields. During the following months, the Town Clerk visited the following towns and cities — Dover, Walsall, Wednesbury, Darlaston and Birmingham — to examine those tramway systems then in use. Having seen several different modes of traction in operation, the Clerk reported back to the Council that in his opinion he had seen no system as suitable as that seen in Dover, where the motive power for the tramway system was provided by overhead electric cables. In 1899, Parliament passed the Ilkeston Corporation Tramways Act, thus allowing the Council to press ahead with the project. Despite earlier calculations, it was finally estimated that the cost of the construction of the system would amount to a total of £80,345. This accounted for £32,479, for the construction of the power station and £47,848 for the construction of the tramway and eight tram cars. Approximately £8,000 was added to the total figure to cover any unforeseen extra costs. There were a number of objections to the proposed tramway system. Local Solicitor John Ormond called for a meeting of ratepayers, the majority of whom voted to petition Parliament opposing the project. A number of tradesmen and shopkeepers, whose businesses lay along the route also objected. These few objections were over-ruled, Alderman Robinson claiming that 75% of the populace were fully in favour of this new mode of transport. Construction should have begun in August 1900 and scheduled for completion by August the following year. In the event, work did not begin until November 1901. When work was finally completed the system consisted of 3.85 miles of track and overhead cable — nine tramcars (as opposed to the original eight) — and the tram depot and offices on Park Road. The townsfolk of Ilkeston could now look forward to travelling with comparative ease — from Church Street in Cotmanhay — along Cotmanhay Road to the bottom of Bath Street — up Bath Street to the junction of Station Road, from where a change of tramcar would take the passenger down to Ilkeston Junction. From Bath Street the traveller could then continue to the Market Place — along South Street — down Nottingham Road and eventually through to Hallam Fields. Each tramcar could carry a maximum of 48 seated passengers and initially, the ticket price was set at 1d, though this would rise over the years to 3d for the full journey from Cotmanhay to Hallam Fields. On Saturday 16th May 1903, all nine of the Corporation’s vehicles, painted in maroon and cream and heavily festooned with bunting and other decorations, trundled out of the Park Road depot for the first time and out onto the streets of Ilkeston. The route was lined with cheering (and not to say curious) Ilkestonians. Eventually 13 tramcars would be operated on the system. 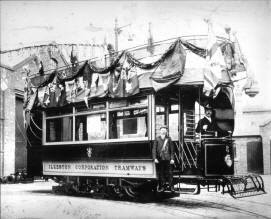 Thomas Roe, a local printer, had secured the advertising rights for £13 per tramcar per annum. Each tramcar bore posters promoting such products as Sunlight Soap and Colman’s Mustard, as well as advertising local businesses as Wooliscrofts Drapers and Outfitters and Broughton’s the watch and clock maker, both of Bath Street. Other adverts promoting The Nottingham Evening Post and the Nottingham Empire Theatre were also carried by the tramcars. The novelty of the new system soon wore off and almost from the outset, the trams lost money, reaching peak in 1913 of £3,300 and debts eventually reaching £32,495. 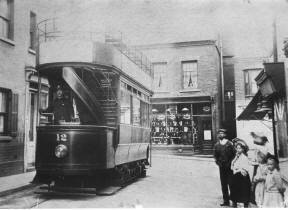 In 1916, the Council decided to sell off the business to the Notts and Derby Tramways Company for £28,150. Re-painted in their new colours of light green (later dark green) and cream and with a reduced fleet of just eight tramcars, the system ran for another 15 years before being fully replaced by trolley buses in 1931. Of the original tramway system, little if anything remains. A section of rail track and two of the seats from the upper deck of an Ilkeston tramcar can be seen at the Erewash Museum. An electrical junction box stands on the corner of the Market Place adjacent to the churchyard, while what is alleged to have once been the lower deck of one of the tramcars stands in the rear garden of a house on Heanor Road. Trams and Trolley Buses of Ilkeston 1903-1953 by John David Watts.